Even if you know people who have benefited from chiropractic care, this natural healing modality can seem mysterious or even exotic if you’ve never actually undergone it yourself. Here are the answers to some frequently asked questions about chiropractic care, courtesy of our chiropractors in Hilton Head Island, to help you determine whether this form of conservative care might be for you. Chiropractic adjustment is the manipulation of a joint that is experiencing a subluxation, an internal misalignment that hinders motion, causes pain and may contribute to larger musculoskeletal and neurological issues. By correcting the joint’s alignment, we can restore lost range of motion, relieve acute/chronic pain and help your entire body function better. While the term chiropractic” means “done by hand,” modern chiropractic adjustments can also be aided by handheld instruments. In most cases, your chiropractor will administer precise amounts of high-velocity, low-amplitude (HVLA) force to the joint in need of adjusting as you sit or lie on a treatment table. Chiropractic care can relieve joint pain, allow for straighter posture (thus relieving muscle strain) and release pinched nerves. The latter improves nerve function, which in turn can help every system in your body operate more efficiently. As for risks, chiropractic care is considered one of the safest forms of treatment you can have. Discomfort is rare, apart from occasional minor soreness. Our chiropractors in Hilton Head Island use chiropractic care to treat sports/auto/workplace injuries, degenerative spinal conditions, headaches, back pain, neck pain and various musculoskeletal imbalances. We also use for preventative wellness care. What can I expect from a consultation with your chiropractors in Hilton Head Island? At your first consultation we will discuss your medical history and current symptoms while evaluating your musculoskeletal system for signs of subluxation. If necessary or desired, we can proceed with your first adjustment at that point. Don’t be alarmed if you hear a “crack” or “pop” during your adjustment — this is just gas escaping from inside the joint, a harmless phenomenon known as cavitation. Should I expect to receive multiple chiropractic treatments? While you may experience significant improvement after your very first treatment, we may recommend completing a series of treatments to reinforce the adjustment and make it your “new normal.” The amount of sessions will vary depending on the nature of your problem. 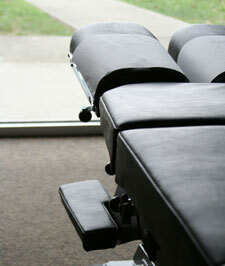 What other treatment methods complement chiropractic care? A variety of natural healing modalities can work well with chiropractic care. We may recommend such techniques as massage, physiotherapy and corrective exercises to help you get the most out of your treatment. As happy as we are to answer your questions here, the best way to gain a stronger understanding of chiropractic care is to experience it. Reach out to us to get started!